Almost a year ago, I wrote a post about re-evaluating the many claims made about Charles Frederick Worth's innovations in the couture industry. It included a paragraph on how there aren't any labels in dresses that predate Worth's career (or, technically, the existence of Worth & Bobergh, 1858-1871) and on the existence of labels in other items of clothing from the late 18th century, but ultimately didn't come to a conclusion on the matter. A recent discussion on a fashion history board brought the issue to mind again. Lacking documentary evidence for sewing brand labels inside gowns - even Ingrid Mida says in The Dress Detective that Worth is only "said to have been the first", and The Opulent Era: Fashions of Worth, Doucet, and Pingat, which might be one of the best sources on late 19th century haute couture, says that "whether this house was the first dressmaking establishment to identify its creations is not known ..." - I thought to go looking into extant garments with labels. We have a fairly solid baseline to look earlier from, given that the labeled Pingat evening gown in the Albany Institute of History and Art was purchased on an 1867 trip to Paris. The earliest I thought that I'd found was this wedding dress from the Chicago History Museum, dated to 1861. However, reading the description made it clear that there's no label inside - the gown is only attributed to Worth & Bobergh (perhaps because of family lore or historic correspondence). There is also a dress that appeared in the Worth and Mainbocher exhibit at the Museum of the City of New York which looks to date to the very early years of Worth & Bobergh (39.26a-b; it's placed at about 1896 in the timeline for some reason), but it likewise is not labeled, per correspondence with the museum. So, one moves on. It is there dated to 1862-1865. However, with apologies to the team that catalogued the Brooklyn Museum collection, this just doesn't feel right to me. Sleeves this narrow came into fashion in late 1864; the skirt also seems to fit over the more elliptical hoop of the middle of the decade. I cannot find any fashion plates to compare the skirt trim to, but the overall size and direction of the ruffles is somewhat reminiscent of a style of overskirt fashionable in 1865. The evening bodice is also cut straight across at the waistline (and adorned with long, narrow tabs) rather than being pointed, which inclines the date to 1865. This robe à transformation from a dressmaker known as Marguerite bears the hallmarks of the same time period, and I would be reluctant to say that either was definitely made before the other. This evening dress by Pingat & Co. is also likely from 1864-1865. These seem to be the last years in which an evening waist with a pointed lower edge was worn (for a while), and we also start to see long vertical skirt trims in 1864 turning up more frequently in early-to-mid 1865. This Pingat gown is a little tricky to date. The label reads "Pingat & Cie", which puts it after 1863 or 1864 and, since labels from the late 1860s and beyond usually just have "Pingat", probably before 1867 or so. 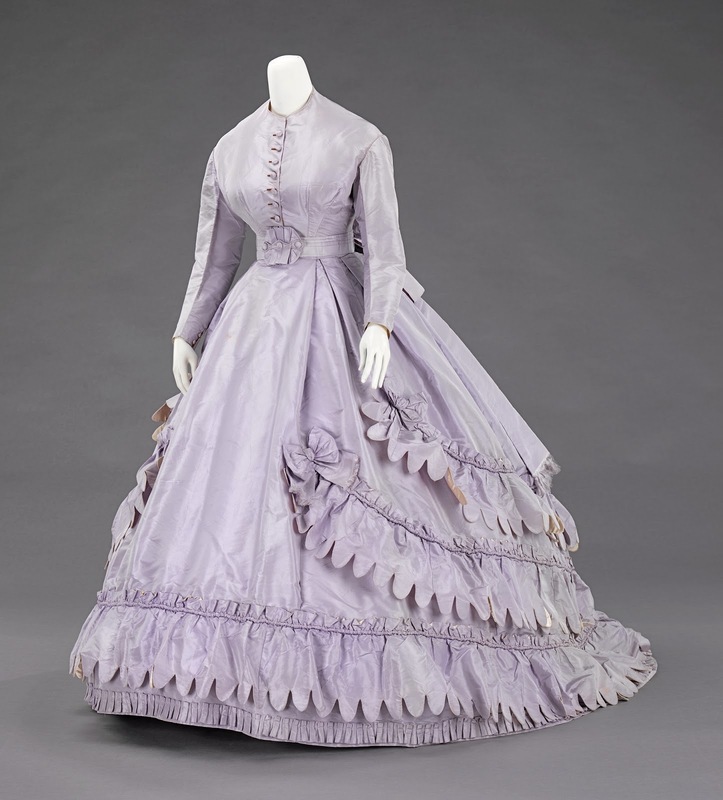 With the elliptical skirt and peplum/overskirt emphasizing the back, it appears to be from the very late 1860s or early 1870s, and the pointed waistline is an infrequent but actual design element in the early 1870s. However, the pointed waistline is also a design element very common to the early 1860s, as described above. The museum dates it to ca. 1860, but the skirt simply seems too long in the back to be worn over a round hoop; The Opulent Era dates it to 1864, but also dresses the skirt over more fluff, and it really looks ca. 1872 there. So I'm not sure what to make of this one, but I think it does not represent the earliest known labeled gown. Anyway, what's the verdict? To me, lacking the smoking gun of a noticeably early labeled gown or a document of the period mentioning the labels, it seems very uncertain that Worth was necessarily the first to use a dress label - or at least, if he was, it was not the case that he was the only one doing it for very long. Perhaps it's time to insert some doubt into the usually definite statement that the House of Worth invented the fashion label. Alexandre Vassiliev has a Worth day dress in his collection that is ca. 1865. Yep, there are other Worth & Bobergh labels from around and just later than this time - what I was trying to do was find something earlier than the three in the post, which all date to 1864-1865. The mint green gown looks ca. 1868 to me, and the one at the Museu del Disseny, from the back view, looks to be 1865-1867. But thank you for sharing them, I hadn't seen them before! The fancy dress looks to me like it's from the 1880s rather than the 1850s - straps rather than a wide neckline with short sleeves, the bodice pleating down to the mid-CF, the swag on the hips. I suspect that whoever posted it at RMG and Co. accidentally switched around two digits, or meant to put Worth's entire working dates and only put the first one, because it does not seem to be from 1858.